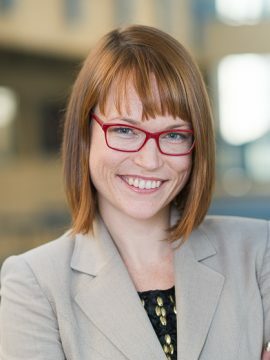 Dr. J. Kiley Hamlin is an Associate Professor of Psychology at UBC, and holds a Tier 2 Canada Research Chair in Developmental Psychology. She received her doctorate from Yale University in 2010, and her undergraduate degree from the University of Chicago in 2005. Her work explores the earliest developmental origins of the human moral sense, by examining precursors to moral cognition and action in preverbal infants. She is currently an Associate Editor at Cognition, and on the editorial boards of Developmental Psychology, Child Development Perspectives, and Perspectives on Psychological Science. Dr. Hamlin is also part of the Early Development Research Group, a consortium of six research centres interested in the development of language, learning, and social understanding in infants and children. My research focuses on the role of evaluative processes in our everyday cognitions about the world. In particular, I examine our tendency to judge individuals’ actions as good or bad, as deserving of reward or punishment, and as morally praiseworthy or blameworthy, asking whether and how these social and moral evaluations influence our understanding of others’ future acts, their mental states, and their underlying personalities. I examine these questions using preverbal infants and young toddlers, in order to study the foundational origins of these processes before complex cognitive abilities (such as language and inhibitory control) fully develop, and prior to extensive influence from cultural norms and values. Koenig, M.K., Tiberius, V., & Hamlin, J.K. (in press). Children's Judgments of Epistemic and Moral Agents: From Situations to Intentions. Perspectives on Psychological Science. Steckler, C.M., Liberman, Z., Van de Vondervoort, J.W., Slevinsky, J., Le, D.T., & Hamlin, J.K. (2018). Feeling out a link between feeling and infant sociomoral evaluation. British Journal of Developmental Psychology, 36(3), 482-500. doi: 10.1111/bjdp.12232. Van de Vondervoort, J. W., & Hamlin, J. K. (2017). Preschoolers’ social and moral judgments of third-party helpers and hinderers align with infants’ social evaluations. Journal of Experimental Child Psychology. 164, 136-151. Zhao, W., Baron, A.S., & Hamlin, J.K. (in press). Using Behavioral Consensus To Learn About Social Conventions In Early Childhood. Frontiers in Psychology. Van de Vondervoort, J. & Hamlin, J.K. (2016). Evidence for intuitive morality: preverbal infants make sociomoral evaluations. Child Development Perspectives. DOI: 10.1111/cdep.12175. Van de Vondervoort, J.W., & Hamlin, J.K. (in press). The infantile roots of sociomoral evaluations. In K. Gray & J. Graham (Eds. ), The atlas of moral psychology. New York: Guilford Press. Submission 26 pages. Van de Vondervoort, J.W., & Hamlin, J.K. (2015). Commentary: Young children remedy second- and third- party ownership. Trends in Cognitive Sciences. DOI: 10.1016/j.tics.2015.07.006. Hamlin, J.K., & Steckler, C.M. (2015). The moral infant: On the roots of moral reasoning and behavior in the first two years, in Emerging Trends in the Social and Behavioral Sciences. R. Scott & S. Kosslyn (Eds. ), Hoboken, NJ: John Wiley and Sons. Submission 9 pages. Hamlin, J.K. (2015). The infantile origins of our moral brains. In J. Decety & T. Wheatley (Eds. ), The moral brain: A multidisciplinary perspective. Pp 105-122. Cambridge, MA: MIT Press. Hamlin, J.K. (2015). Does the infant possess a moral concept?. In E. Margolis & S. Laurence (Eds. ), The Conceptual Mind: New Directions in the Study of Concepts. Pp 477-518. Cambridge, MA: MIT Press. Aknin, L.B., Fleerackers, A. L., & Hamlin, J. K. (2014). Can third-party observers detect the emotional rewards of generous spending? Journal of Positive Psychology, 9(3): 198 – 203. doi: 10.1080/17439760.2014.888578. Earp, B. D., Everett, J.A.C., Madva, E. N., & Hamlin, J.K. (2014). Out, damned spot: Can the "MacBeth Effect" be replicated? Basic and Applied Social Psychology, 36: 91-98. DOI: 10.1080/01973533.2013.856792. Hamlin, J.K. (2014). The conceptual and empirical case for social evaluation in infancy: Commentary on Tafreshi, D., Thompson, J.J., & Racine, T.P. (2014). An analysis of the conceptual foundations of the infant preferential looking paradigm. Human Development, 57(4), 250-258. DOI:10.1159/000365120. Hamlin, J.K. (2013). The origins of human morality: Complex sociomoral evaluations by preverbal infants. In J. Decety, & Y. Christen (Eds. ), Research and Perspectives in Neurosciences. Pp 165-188. Switzerland: Springer International Publishing. Hamlin, J.K., Wynn, K., & Bloom, P. (2012). 'Nuanced social evaluation: Association doesn’t compute. In response to Scarf, D., Imuta, K., Colombo, M., & Hayne, H. (2012). The golden rule or valence matching? Methodological problems in Hamlin et. al. Proceedings of the National Academy of Sciences of the United States of America (PNAS), 109(22), E1427. Hamlin, J.K., Wynn, K., & Bloom, P. (2012). The case for social evaluation in infants. Response to Scarf, D., Imuta, K., Colombo, M., & Hayne, H. (2012). Social evaluation or simple association? Simple associations may explain moral reasoning in infants. Public Library of Science (PLoS ONE), http://www.plosone.org/annotation/listThread.action?root=52853. Aknin, L.B., Hamlin, J.K., & Dunn, E. W. (2012). Giving leads to happiness in young children. PLoS ONE, 7(6): e39211. doi: 10.1371/journal.pone.0039211. Hamlin, J.K., & Wynn, K. (2012). Who knows what’s good to eat? Infants fail to match the food preferences of antisocial others. Cognitive Development, 27(3): 227 - 239. doi: 10.1016/j.cogdev.2012.05.005. Hamlin, J.K. (2012). A developmental perspective on the moral dyad: A commentary on Gray, K., Young, L. & Waytz, A. (2012). The moral dyad: A fundamental template unifying moral judgment. Psychological Inquiry, 23(2), 166 - 171. Hamlin, J.K., Wynn,K., & Bloom, P. (2008) Social evaluation by preverbal infants. Pediatric Research, 63(3), 219 - 219.